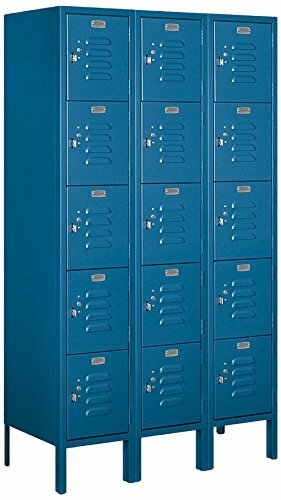 Salisbury 65000 Series Five Tier Box Style Standard Metal Lockers are ideal for colleges, high schools, locker rooms, employee changing rooms, government agencies, gyms and many other applications. Constructed of 16 gauge steel. Available as unassembled or assembled (additional charge for assembled). Feature a durable powder coated finish available in gray, tan or blue. Available in 5 foot height (add 6" for legs). Units have compartment sizes that are 12" wide, 12" high and 12", 15" or 18" deep. Available as 1 wide or 3 wide units. Salisbury Industries is an ISO 9001: 2008 certified company and has excelled in the field of manufacturing since 1936. If you have any questions about this product by Salsbury Industries, contact us by completing and submitting the form below. If you are looking for a specif part number, please include it with your message.